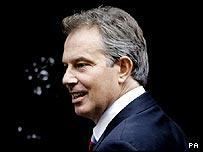 The United Nations Security Council has backed Tony Blair's call to outlaw incitement to terrorism. The UN is meeting in an effort to find consensus on moves to reform the body, as well as tackling poverty. But Mr Blair has also ensured terrorism is on the agenda and said the world must make sure "the future does not belong to fanatics". Terrorists would not be defeated until "our passion for the democratic way is as great as their passion for tyranny".